Do You Think Exalted 3rd Edition Can Compete With The Visual Design Of Other Systems? Considering overall visual design and layout, not just quality of individual pieces of artwork, I think we are safe at least for the Core Book with Maria Cabardo working on it. 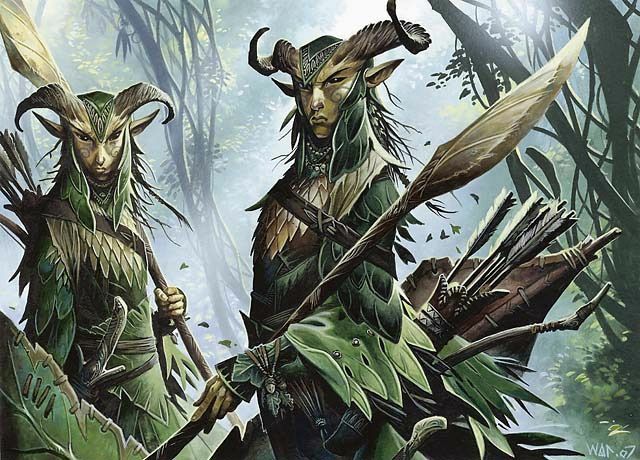 I mean, among other achievements, she was responsible for the look and feel of Magic the Gathering when working for WotC, which I still think is one of, maybe the best looking card game around. She was also the art director for the Vertigo line of DC comics. More RPG-specific, was responsible for the graphic design and layout of Cthulhutech, one of the best looking RPGs of the last decade. I Think Exalted 3rd edition will do fine in graphic design. Is it me or is the Strawmaiden the least interesting thing in her own artwork? Her weapon looks dumb (to me, if i have to state it's my opinion explicitly) as well and just really awkward to use with that deep a curve on the blade. The funky Fair Folk monsters in the background however look way better. It's just...people go on about the Strawmaiden like it's some kind of truly awesome badass thing while I found the fiction ok, alright, not bad, other noncomittal phrases and her art much the same, bits are good, others really...uninteresting. Basically pepole are telling me 'look how awesme 3e will look, this is the best art to represent just how damned cool it will be!' and the stuff they show me makes me go...'eh, s'alright I guess'. Is it me or is the Strawmaiden the least interesting thing in her own artwork? Her weapon looks dumb (to me, if i have to state it's my opinion explicitly) as well and just really awkward to use with that deep a curve on the blade. The funky Fair Folk monsters in the background however look way better. It's just...people go on about the Strawmaiden like it's some kind of truly awesome badass thing while I found the fiction ok, alright, not bad, other noncomittal phrases and her art much the same, bits are good, others really...uninteresting. Basically pepole are telling me 'look how awesme 3e will look, this is the best art to represent just how damned cool it will be!' and the stuff they show me makes me go...'eh, s'alright I guess'. I disagree, it's clearly this magical tool, a tool of harvest which in the hands of Janest is a weapon. Ten Sheaves was not a war god, he was a God of Harvest for Janest's village, so it makes sense that the scythe is her weapon, though I could see a sickle just as thematically appropriate. The whole picture evokes a theme of harvest, and of pilgrims, something of a more western ideal which I actually enjoy and find refreshing in Exalted. She is awesome because she alone is facing this fey horde, empowered by a god, what is more Exalted then that? They snagged Cthulhutech's art director, who does just fantastic work. So as far as art goes, it'll be top-tier (provided the budget holds out). Now, interior layout and design... who knows? Don't know who's on that team. Once, there was a maiden... who spent all her time on the internet. "Someone out there is WRONG," she said. So she tossed a noose made of golden light... and strangled her opponent. Both of them died alone. "Love is for football players and cheerleaders," her obituary said. I think the big thing with Janest's Grimscythe being curved that much is because she's an Exigent of the Harvest - it makes sense that she'll be using an agricultural implement jacked up to 11 rather than a purpose-built polearm. Farming scythes aren't curved as sharply as that one is. It's a scythe! And not even the kind of scythe where they turn the blade so it's like a glaive, it's got a regular sideways backward-curving blade, because that's what people want when they want a character who fights with a scythe. Realism is such a distant concern it need not even be mentioned. Farming scythes also aren't usually empowered by dead deities of the harvest. Now I really hope Janest has an evocation to turn her scythe into a cradle scythe as a supermode. It is certainly no more impractical as a scythe than most Daiklave designs would be impractical as swords. Plus, she's up against the Fair Folk. Sure, she could go with a totally practical weapon design, but how do you think they'd respond? "Ugh, another practical grand grimscythe. I guess we're all about efficiency and form-follows-function today. Fine, whatever, send in the artillery to bomb her into a glowing crater while the rest of our army just walks around the lone defender." By showing up to the fight with a badass, yet horribly impractical, weapon, she compels the Wyld armies to follow suit with patently absurd Hollywood Tactics. Amateur isn't bad necessarily, but they usually have a lot less means to produce their books, and art is the first thing to suffer - not everybody can afford Wayne Reynolds to draw guys fighting weird monsters for you. Wayne Reynolds is a very skilled and lovely person, but the day his art shows up in Exalted is the day I quit buying it. It's all jarring, flat faces, weirdly angled feet, and excessive props; it's also so powerfully *his* style that looking at it breaks your immersion; you don't think "hey, this is a warrior," you think, "hey, this is a warrior that Wayne Reynolds drew." "Harvest Scythe - Decapitation Mode!" I think his art would really be suited to Noble Fey and Abyssals, his characters often have that really unnerving sort of perfection to their features. I agree though that his style is quite distinct, though that might be tempered a bit if he had to work within the conceptual space of Exalted. To me his art is synonymous with Pathfinder, and I think it would be great if Onyx Path could find a artist to fill that role in their system. Last edited by turkeygiant; 05-29-2014, 01:42 AM. Her scythe is curved roughly like a normal scythe, not crooked back super-weird. It's not being held with the blade pointed straight up, it's pointed partially away from the viewpoint and is receding. That said, war scythes are iconic peasant-uprising weapons, and generally awesome, so pointing the blade out into a normalish polearm would be cool too. Last edited by Nicias; 05-29-2014, 04:14 PM. All times are GMT-5. This page was generated at 05:00 PM.